Carter Nelson of Columbia, who is a member of the Flyers Aquatic Swim Team in St. Louis, participated in the Speedo Winter Junior Nationals in Iowa over the weekend. The event was sanctioned by USA Swimming. 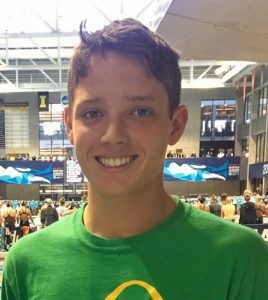 Carter posted personal best times of 21.40 seconds in the 50 meter freestyle and one minute, 41.27 seconds in the 200 meter freestyle events at Junior Nationals. “Proud of this swimmer and his commitment to excellence,” FAST swimming coach Raz Cuparencu posted on Twitter. Carter, a sophomore at Columbia High School, is the son of Brandi and Rich Nelson. “The Speedo Winter Junior Nationals is a huge accomplishment just to get to,” CHS swimming coach Jen Traube said. Carter participated in the IHSA state swim meet earlier this year at New Trier High School near Chicago, placing 32nd overall in the 200 meter freestyle with a time of 1:45.32 and 23rd in the 100 meter freestyle with a time of 48.07. He posted the fastest freshman time in the 100 meter freestyle event at state.